Bryce Harper will return to Nationals Park Tuesday, this time as a member of the visiting Phillies. Jimmy Stewart was 31 years old when the movie Mr. Smith goes to Washington hit the theaters to outstanding reviews in 1939. Stewart, in fact, was nominated for his first best-actor Academy Award for that movie. He did not win. Bryce Harper was only 19 when he arrived in Washington to begin his major-league career with the Nationals in 2012 and the reviews of his seven D.C. seasons were mostly good. He did not, however, win a World Series. Phillies podcast: After making a big impression in Philly, how will Bryce Harper be received in D.C.? Stewart was nominated four more times for the best-actor award, but he won it only once: for his role as Macaulay “Mike” Connor in the 1940 film The Philadelphia Story. Bryce Harper has 13 seasons to try to win a World Series in Philadelphia. Who would have thought that Jimmy Stewart and Bryce Harper had so much in common? Anyway, Mr. Harper will make his return to Washington on Tuesday night when the Phillies open a two-game series at Nationals Park. It should be great theater, starting with his 3 p.m. news conference. You’re signed up to get this newsletter in your inbox every weekday during the Phillies season. If you like what you’re reading, tell your friends it’s free to sign up here. I want to know what you think, what we should add, and what you want to read, so send me feedback by email or on Twitter @brookob. Thank you for reading. Jayson Werth knows as well as anyone what it is like to go from hero to villain in the same ballpark. He lived through it at Citizens Bank Park, where Phillies fans who once applauded his power and postseason heroics reviled him during his seven seasons with the Washington Nationals. It was complicated, but it was also difficult to watch. Fortunately, there was a mending of fences last year when Werth appeared at the 10-year anniversary of the Phillies’ 2008 World Series title. So how does Werth think Harper will be treated when he returns to Nationals Park in a Phillies uniform Tuesday night? “I don’t expect it to be the same as when I went back to Philly,” Werth said. "I think there’ll be a little bit of everything. D.C. is not the same fan base as Philadelphia. I mean they have some diehards and it grew into a pretty cool place to play. By the end, we actually had a huge following. Ryan Zimmerman, the longest-tenured member of the Nationals, said he is hoping that Harper is greeted warmly upon his return. “I would hope it is a good one,” Zimmerman said. "We didn’t reach the ultimate goal when he was here, but what we did in parts of the six or seven seasons he was here was a pretty good time for the organization considering how young we were. We have only been around for 15 years and winning the division four out of six years and becoming a team that was expected to win every year, he was a huge part of that. 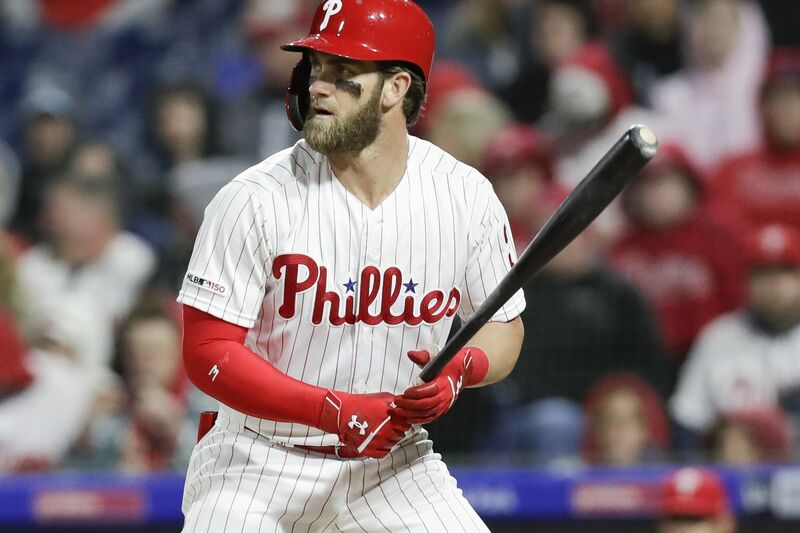 Rhys Hoskins was drilled in the left shoulder two pitches after Harper hit his second home run of the season Sunday night. It might have been an accident, but columnist Bob Ford thinks the Phillies’ Hello Dolly productions after their eight home runs in the series might also have irritated the Atlanta Braves just a little bit. It’s something to keep an eye on. If you’re still catching up on your reading, here’s the lengthy profile I did on Bryce Harper after a recent trip to his hometown of Las Vegas. It will also be appearing in print the next three days. Tonight: Bryce Harper returns to Nationals Park, 7:05 p.m . Tomorrow: Aaron Nola faces Nats in series finale, 1:05 p.m.
Friday: Nick Pivetta pitches first game of home series vs. Minnesota, 7:05 p.m.
Saturday: Jake Arrieta faces Twins at 2:05 p.m.
Nationals pitcher Max Scherzer is 9-2 with a 2.64 ERA in 17 career starts against the Phillies. Do not underestimate the value of the Phillies’ three-game opening sweep against the Atlanta Braves. A year ago, they lost two out of three in Atlanta to start the season, then two more on the road against the New York Mets. It was the start of disastrous divisional play for the Phillies. They went 34-42 against the NL East, including 7-12 against the Braves, who went on to win the division. They were 46-40 against all other teams in baseball. Going against Nationals ace Max Scherzer, the Phillies will be hard-pressed Tuesday to remain unbeaten. Scherzer, a three-time Cy Young Award winner, is 9-2 with a 2.64 ERA in 17 career starts against the Phillies and has struck out 138 in 112 2/3 innings. Hoskins is 0-for-11 with seven strikeouts against Scherzer. Odubel Herrera (14-for-41 with two home runs and five RBIs) is the only Phillies hitter with at least 10 plate appearances who is batting better than .200 against Scherzer. Question: Love Extra Innings. Regarding Jake Arrieta, although starting wild and walking 6, he was able to K 6, and allow only 3 hits and 1 run throwing 104 pitches in 6 innings on a cold, windy night at “The Bank”. What was really encouraging was his fluidity of motion and the movement on his pitches. He just looked so much better than last year. Thoughts? Answer: Thanks for the kind words, Dave. I agree with you on Arrieta. I was not at the game Sunday night, but I watched it on television and I thought the movement on his pitches was wicked good and better than it was a season ago. He will have to be able to control that movement, but I did think it was a good start for a vital member of the Phillies rotation.